You can change the look and feel of the Pro Client and Brand portal to match the style of the brand for which it is used, for example by matching it with the branding of your company, product or publication. As admin, open the Management Console. On this page you can configure the branding to your liking. On the right hand side of the screen, you can see a preview of the settings you have configured. Depending on the colors you choose, overlaying text will automatically adjust color to remain readable. 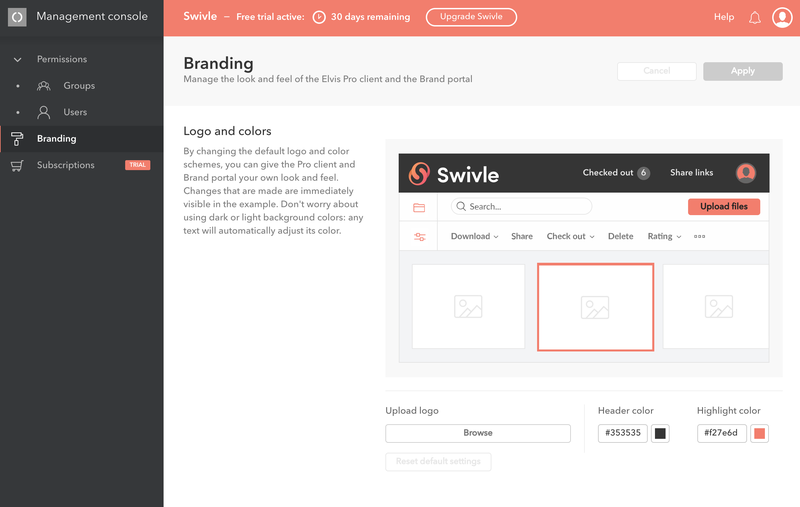 When you are satisfied with your configuration, click Apply in the top right screen to apply the branding to your Swivle environment. Note that sometimes you might need to clear your browser cache before the branding is properly applied in your browser.